Culture sector is one of the Major Programmes of UNESCO. The United Republic of Tanzania, implements UNESCO Culture Programmes through UNESCO Culture Conventions to which the government is a signatory. Although there are some other programmes that the government of Tanzania implements, many activities fall under implementation of Conventions. UNESCO Culture programmes are divided into two major aspects, tangible and intangible. Looking broadly into UNESCO Culture Conventions, one will find that formulation of various programmes and activities reflects protection and sustainability of tangible or intangible aspects of cultural heritage. The Culture Sector at the UNESCO National Commission of the United Republic of Tanzania implements its activities, in collaboration with government Ministries, Departments and Non government organization. Convention on the Means of Prohibiting and Preventing the Illicit Import, Export and Transfer of Ownership of Cultural Property (1970)– Ratified in 02/08/1977. Convention Concerning the Protection of the World Cultural and Natural Heritage (World Heritage Convention, 1972)– Ratified in 02/08/1977. Convention for the Safeguarding of the Intangible Cultural Heritage (2003) – Ratified in 18/10/2011. This collaboration is through involving National Museums in available opportunities such as training offered by UNESCO, sharing information in case of a loss of cultural object(s) so that it can be returned. It is through this collaboration that Tanzania through intergovernmental committee of the Convention, Tanzania was able to recover the Makonde Mask in May, 10th 2010 which was stolen in 1980s in the National Museums. The Ngorongoro Conservation Area (809,440 ha) spans vast expanses of highland plains, savanna, savanna woodlands, and forests, from the plains of the Serengeti National Park in the north-west, to the eastern arm of the Great Rift Valley. The area was established in 1959 as a multiple land use area, with wildlife coexisting with semi-nomadic Maasai pastoralists practicing traditional livestock grazing. It includes the spectacular Ngorongoro Crater, the world’s largest caldera, and Olduvai Gorge, a 14km long deep ravine. The property has global importance for biodiversity conservation in view of the presence of globally threatened species such as the Black Rhino, the density of wildlife inhabiting the Ngorongoro Crater and surrounding areas throughout the year, and the annual migration of wildebeest, zebra, Thompsons and Grants gazelles and other ungulates into the northern plains. The area has been subject to extensive archaeological research for over 80 years and has yielded a long sequence of evidence of human evolution and human-environment dynamics, collectively extending over a span of almost four million years to the early modern era. This evidence includes fossilized footprints at Laetoli, associated with the development of human bipedalism, a sequence of diverse, evolving hominin species within Olduvai gorge, which range from Australopiths such as Zinjanthropusboisei to the Homo lineage that includes Homo habilis, Homo erectus and Homo sapiens; an early form of Homo sapiens at Lake Ndutu; and, in the Ngorongoro crater, remains that document the development of stone technology and the transition to the use of iron. The overall landscape of the area is seen to have the potential to reveal much more evidence concerning the rise of anatomically modern humans, modern behavior and human ecology. 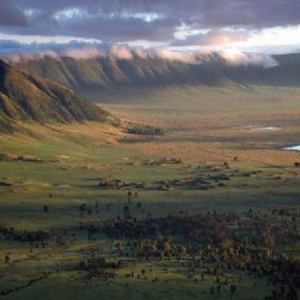 Criterion (viii): Ngorongoro crater is the largest unbroken caldera in the world. The crater, together with the Olmoti and Empakaai craters are part of the eastern Rift Valley, whose volcanism dates back to the late Mesozoic / early Tertiary periods and is famous for its geology. The property also includes Laetoli and Olduvai Gorge, which contains an important palaeontological record related to human evolution. Criterion (ix): The variations in climate, landforms, and altitude have resulted in several overlapping ecosystems and distinct habitats, with short grass plains, highland catchment forests, savanna woodlands, montane long grass plains and high open moorlands. The property is part of the Serengeti ecosystem, one of the last intact ecosystems in the world which harbors large and spectacular animal migrations. Criterion (x): Ngorongoro Conservation Area is home to a population of some 25,000 large animals, mostly ungulates, alongside the highest density of mammalian predators in Africa including the densest known population of a lion (estimated 68 in 1987). The property harbors a range of endangered species, such as the Black Rhino, Wild hunting dog and Golden Cat and 500 species of birds. 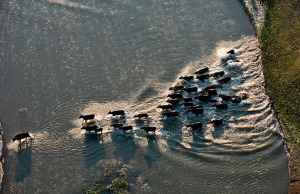 It also supports one of the largest animal migrations on earth, including over 1 million wildebeest, 72,000 zebras and c.350,000 Thompson and Grant gazelles. Located on two islands close to each other just off the Tanzanian coast about 300km south of Dar es Salaam are the remains of two port cities, Kilwa Kisiwani and Songo Mnara. The larger, Kilwa Kisiwani, was occupied from the 9th to the 19th century and reached its peak of prosperity in the13th and 14th centuries. In 1331-1332, the great traveler, Ibn Battouta made a stop here and described Kilwa as one of the most beautiful cities in the world. Kilwa Kisiwani and Songo Mnara were Swahili trading cities and their prosperity was based on control of Indian Ocean trade with Arabia, India, and China, particularly between the 13th and 16th centuries, when gold and ivory from the hinterland was traded for silver, carnelians, perfumes, Persian faience and Chinese porcelain. Kilwa Kisiwani minted its own currency in the 11th to 14th centuries. In the 16th century, the Portuguese established a fort on Kilwa Kisiwani and the decline of the two islands began. Criterion (iii):Kilwa Kisiwani and SongoMnara provide exceptional architectural, archaeological and documentary evidence for the growth of Swahili culture and commerce along the East African coast from the 9th to the 19th centuries, offering important insights regarding economic, social and political dynamics in this region.The Great Mosque of Kilwa Kisiwani is the oldest standing mosque on the East African coast and, with its sixteen domed and vaulted bays, has a unique plan. It istrue great dome dating from the 13th was the largest dome in East Africa until the 19th century. 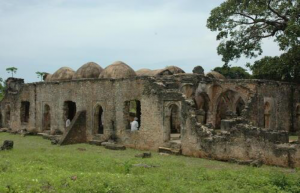 Photo: One of the Old Mosque in Kilwa Kisiwani. In the vast plains of Serengeti National Park, comprising 1.5 million hectares of Savannah, the annual migration of two million wildebeests plus hundreds of thousands of gazelles and zebras – followed by their predators in their annual migration in search of pasture and water – is one of the most impressive nature spectacles in the world. The biological diversity of the park is very high with at least four globally threatened or endangered animal species: black rhinoceros, elephant, wild dog, and cheetah. Criterion (vii): The Serengeti plains harbor the largest remaining unaltered animal migration in the world where over one million wildebeest plus hundreds of thousands of other ungulates engage in a 1,000 km long annual circular trek spanning the two adjacent countries of Kenya and Tanzania. This spectacular phenomenon takes place in a unique scenic setting of ‘endless plains’: 25,000km2 of treeless expanses of spectacularly flat short grasslands dotted with rocky outcrops (kopjes) interspersed with rivers and woodlands. The Park also hosts one of the largest and most diverse large predator-prey interactions worldwide, providing a particularly impressive aesthetic experience. Criterion (x): The remarkable spatial-temporal gradient in abiotic factors such as rainfall, temperature, topography and geology, soils and drainage systems in Serengeti National Park manifests in a wide variety of aquatic and terrestrial habitats. The combination of volcanic soils combined with the ecological impact of the migration results in one of the most productive ecosystems on earth, sustaining the largest number of ungulates and the highest concentration of large predators in the world. 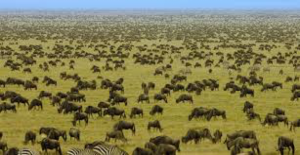 The ecosystem supports 2 million wildebeests, 900,000 Thomson’s gazelles and 300,000 zebras as the dominant herds. Other herbivores include 7,000 elands, 27,000 topis, 18,000 hartebeests, 70,000 buffalos, 4,000 giraffes, 15,000 warthogs, 3,000 waterbucks, 2,700 elephants, 500 hippopotamuses, 200 black rhinoceroses, 10 species of antelope and 10 species of primate. Major predators include 4,000 lions, 1000 leopards, 225 cheetahs, 3,500 spotted hyenas and 300 wild dogs. Of these, the black rhino Dicerosbicornis, leopard Pantherapardus, African elephant Loxodontaafricana and cheetah Acinonyxjubatus are listed in the IUCN Red List. There are over 500 species of birds that are perennially or seasonally present in the Park, of which five species are endemic to Tanzania. The Park has the highest ostrich population in Tanzania and probably Africa, making the population globally important. The Selous Game Reserve, covering 50,000 square kilometers, is amongst the largest protected areas in Africa and is relatively undisturbed by human impact. The property harbors one of the most significant concentrations of elephant, black rhinoceros, cheetah, giraffe, hippopotamus, and crocodile, amongst many other species. The reserve also has an exceptionally high variety of habitats including Miombo woodlands, open grasslands, riverine forests, and swamps, making it a valuable laboratory for on-going ecological and biological processes. Criterion (ix): The Selous Game Reserve is one of the largest remaining wilderness areas in Africa, with relatively undisturbed ecological and biological processes, including a diverse range of wildlife with significant predator/prey relationships. The property contains a great diversity of vegetation types, including rocky acacia-clad hills, gallery and groundwater forests, swamps and lowland rainforest. The dominant vegetation of the reserve is deciduous Miombo woodlands and the property constitutes a globally important example of this vegetation type. Because of this fire-climax vegetation, soils are subject to erosion when there are heavy rains. The result is a network of normally dry rivers of sand that become raging torrents during the rains; these sand rivers are one of theunique features of the Selous landscape. Large parts of the wooded grasslands of the northern Selous are seasonally flooded by the rising waters of the Rufiji River, creating a very dynamic ecosystem. Criterion (x): The reserve has a higher density and diversity of species than any other Miombo woodland area: more than 2,100 plants have been recorded and more are thought to exist in the remote forests in the south. Similarly, the property protects an impressive large mammal fauna; it contains globally significant populations of theAfrican elephant (Loxodontaafricana) (106,300), black rhinoceros (Dicerosbicornis) (2,135) and wild hunting dog (Lycaonpictus). It also includes one of the world’s largest known populations of hippopotamus (Hippopotamus amphibius) (18,200) and buffalo (Synceruscaffer) (204,015). There are also important populations of ungulates including sable antelope (Hippotragusniger) (7000), Lichtenstein’s hartebeest (Alcelaphuslichtensteinii) (52,150), greater kudu (Tragelaphusstrepsiceros), eland (Taurotragusoryx) and Nyassa wildebeest (Connochaetesalbojubatus) (80,815). In addition, there is also a large number of Nile crocodile (Crocodilusniloticus) and 350 species of birds, including the endemic Udzungwa forest partridge (Xenoperdixudzungwensis) and the rufous-winged sunbird (Nectariniarufipennis). Because of this high density and diversity of species, the Selous Game Reserve is a natural habitat of outstanding importance for in-situ conservation of biological diversity. Kilimanjaro National Park covering an area of some 75,575 ha protects the largest free-standing volcanic mass in the world and the highest mountain in Africa, rising 4877m above surrounding plains to 5895m at its peak. 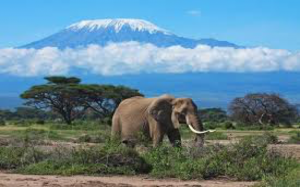 With its snow-capped peak, the Kilimanjaro is a superlative natural phenomenon, standing in isolation above the surrounding plains overlooking the savannah. Criterion vii: Mount Kilimanjaro is one of the largest volcanoes in the world. It has three main volcanic peaks, Kibo, Mawenzi, and Shira. With its snow-capped peaks and glaciers, it is the highest mountain in Africa. The mountain has five main vegetation zones from the lowest to the highest point: Lower slopes, montane forest, heath and moorland, alpine desert and summit. The whole mountain including the montane forest belt is very rich in species, in particular mammals, many of them endangered species. For this combination of features but mostly its height, its physical form and snow cap and its isolation above the surrounding plains, Mount Kilimanjaro is considered an outstanding example of a superlative natural phenomenon. Located on a promontory jutting out from the western side of Unguja island into the Indian Ocean, the Stone Town of Zanzibar is an outstanding example of a Swahili trading town. This type of town developed on the coast of East Africa further expandedunder Arab, Indian, and European influences, but retained its indigenous elements, to form an urban cultural unit unique to this region.The Stone Town of Zanzibar retains its urban fabric and townscape virtually intact and contains many fine buildings that reflect its particular culture, which has brought together and homogenized disparate elements of the cultures of Africa, the Arab region, India, and Europe over more than a millennium. The buildings of the Stone Town, executed principally in coralline ragstone and mangrove timber, set in a thick lime mortar and then plastered and lime-washed, reflect a complex fusion of Swahili, Indian, Arab and European influences in building traditions and town planning. The two-story houses with long narrow rooms disposed around an open courtyard reached through a narrow corridor, are distinguished externally by elaborately carved double ‘Zanzibar’ doors, and some by wide verandahs, and by richly decorated interiors. Together with, the simple ground floor Swahili houses and the narrow façade Indian shops along “bazaar” streets constructed around a commercial space “duka”. The major buildings date from the 18th and 19th centuries and include monuments such as the Old Fort, built on the site of an earlier Portuguese church; the house of wonder, a large ceremonial palace built by Sultan Barghash; the Old Dispensary; St. Joseph’s Roman Catholic Cathedral; Christ Church Anglican Cathedral commemorating the work of David Livingston in abolishing the slave trade and built on the site of the last slave market; the residence of the slave trader Tippu Tip; the MalindiBamnara Mosque; the Jamat Khan built for the Ismaili sect; the Royal Cemetery; the Hamamni and other Persian baths. Together with the narrow, winding street pattern, large mansions facing the seafront and open spaces these buildings form an exceptional urban settlement reflecting the longstanding trading activity between the African and Asian seaboard. In particular, the Stone town’s is also marked by being the site where slave-trading was finally terminated. On the eastern slopes of the Masai escarpment bordering the Great Rift Valley are natural rock shelters, overhanging slabs of sedimentary rocks fragmented by rift faults, whose vertical planes have been used for rock paintings over at least two millennia. The exact number of rock art sites in the Kondoa area is not yet known but it is estimated that there are between 150 and 450 decorated rock shelters, caves and overhanging cliff faces. The sites are located on the steep eastern slopes, an area of spectacular, fractured geological formations, which provided the necessary shelter for the display of paintings. 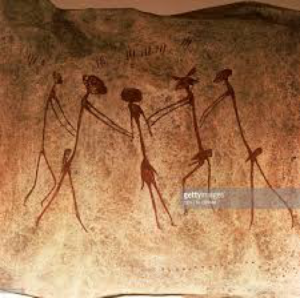 The extensive and dense collection of rock paintings represent and embody the cultures of both hunter-gatherer and pastoralist communities who have lived in the area for several millennia. The similarities with images from southern and central Africa, together with their distinctive streaky style and rare depiction of domesticated animals, make them distinctive examples of hunter-gatherer rock art at its northernmost limit. In the spectacular collection of images from over 150 shelters, many have a high artistic value, and display sequences that provide a unique testimony to the changing socio-economic base of the area, from hunter-gatherer to agro-pastoralist societies, and the beliefs and ideas associated with them. Some of the shelters still have ritual associations with the people who live nearby and are associated with the strong living traditions of the local population. Criterion (iii): The rock art sites at Kondoa are an exceptional testimony to the lives of hunter-gatherers and agriculturalists who have lived in the area for several millennia, and reflect a unique variation of hunter-gatherer art from southern and central Africa and a unique form of agro-pastoralist paintings. Criterion (vi): Some of the rock art sites are still used actively by local communities for a variety of ritual activities such as rainmaking, divining, and healing. These strong intangible relationships between the paintings and living practices reinforce the links with those societies that created the paintings and demonstrate a crucial cultural continuum. 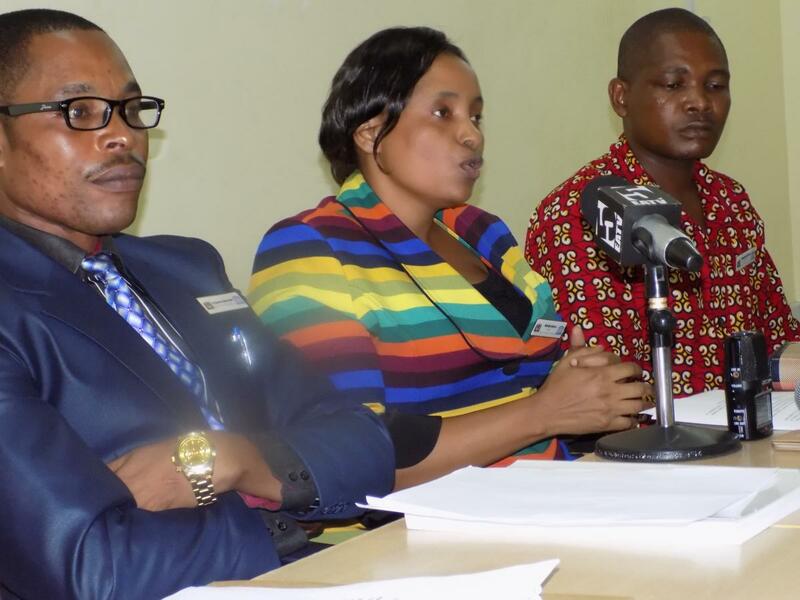 The UNESCO National Commission of Tanzania implements the activities of this Convention in collaboration with the Ministry of Information Culture and Sports. Before and after ratification of this Convention, UNESCO National Commission requested UNESCO to build capacity to Cultural officers so that they can be able to document important Intangible Cultural Heritage and prepare a national representative list of the same. So far documentation of Olengashani is in progress to be submitted to UNESCO as one of the representative list. The project implementation period shall be between 12 and 24 months. The maximum amount that can be requested from the IFCD per project is US$100,000.